Visit us on Facebook for the most up to date events and announcements! 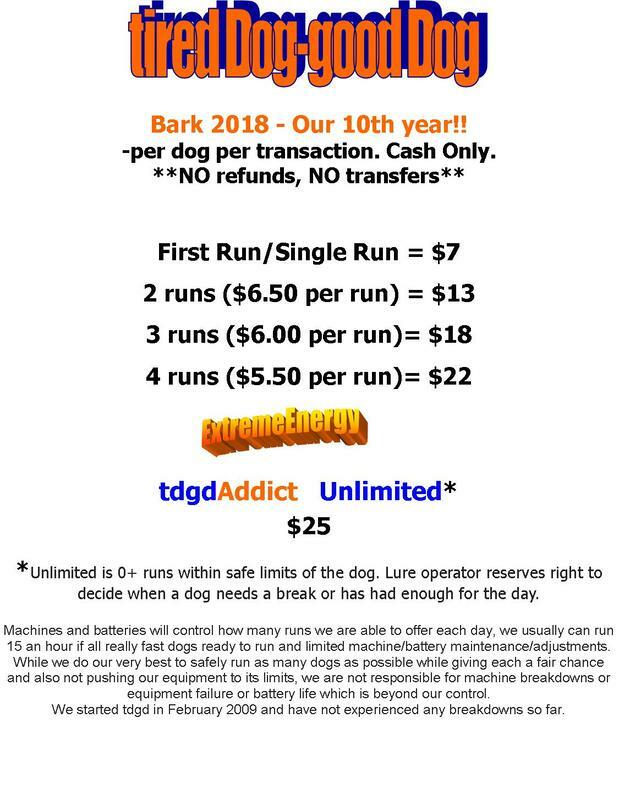 Our 11th year at Bark!! Lancaster, CA - Disneyland FUN activities for dogs! Go to our MAP pages for directions and location details www.tireddog-gooddog.com/barkmaps2018.html . FREE admission, FREE parking. Bring the whole family- great food too! ALL polite, leashed dogs welcome! No retractable leashes. Dogs must be current on all necessary vaccinations. Bark at the Park program (this is 2018 - 2019 not available yet) - see all the activities, information, event map and demo schedules. We are so excited to once again have an ENTIRE PRISTINE GRASS OUTFIELD (Field #1) by the Tot Lot and bathrooms! ALL dogs* and spectators are welcome! The dogs go CRAZY for our fake fur and plastic bag “bunnies”! (There is a picture of the "bunny" on the "Tell Me More" page as well as some close ups of some tdgd Addicts.) Come watch the dogs go crazy- grab some snacks and a drink and plop yourself down on our shaded breezy soft grassy hill with premium views of the whole field. We hurt from laughing from watching how silly the dogs can be while they figure it all out! We are focused on the dogs’ safety #1 and fun #2! Registration is easy! Be sure to read our rules and FYI - available on another page called "Tell Me More". At the event, fill out your paperwork and pay for your runs as early as possible- we sell out fast every year. There are 2 levels of tdgd lure coursing dogs- complete paperwork on site each day and get your run card (one card per dog). You may add runs at any time and be used at future events also. CASH only at the event (exact payment makes us very *happy*). These are dogs that have run with us previously or titled/completed runs toward a title through AKC, UKC or AFSA etc. They already know what to do and are FAST. Complete paperwork and get your run card. Come and go as you please, no strict time to run. These dogs have never run with us and usually need more time and machine/battery wear and tear to “figure it out.” These dogs will try their first run on our small "test track" or a small portion of the large course to give them an opportunity “figure it out” if they are giving us signs they are interested. Most dogs are interested but have never been allowed to do anything like this. Some have no interest at all- it is up to the individual dog- we cannot force them. Watch out when they do- it is usually pretty funny to watch the whole process. A successful test track test will permit them to run their next runs on the full course. Sign up in person at the event and wait in line at the test track to run. Thank you very much to the Bark at the Park committee for inviting us once again. We look forward to seeing our lure coursing "tdgd Addicts" again and meeting Newbies!